Who wrote this crap? Would you believe…? Do they think we’re as dumb as Smart? We know it’s their fault this GET SMART movie retains none of the magic and vitality of Brooks’s and Henry’s TV series. Director Peter Segal‘s pedigree does not bode well either, his last three films trumpeting his mediocrity: THE LONGEST YARD, 50 FIRST DATES, ANGER MANAGEMENT. Segal and Astle and Ember forgot that 1965’s GET SMART was a cheeky spoof of the spy movie genre. GET SMART 2008 is an espionage action movie. 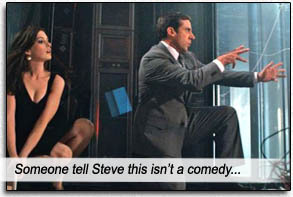 But someone forgot to tell Steve Carell, who thinks he’s being paid for a slapstick comedy. GET SMART 2008 takes itself so seriously, with insufferable CGI (the iconic corridor of security doors, the Cone of Silence), real-world technology and even murders, that Carell looks like an idiot savant dropped into THE BOURNE IDENTITY. Maxwell Smart (Carell) is an analyst at the modern spy agency, CONTROL. He aspires to be a field agent, like the legendary Agent 23 (Dwayne Johnson) or Agent 99 (Anne Hathaway). Throw in an unnecessary backstory about Max being overweight and we have our first waste of screentime in the can. At headquarters, two Information Tech dweebs make the usual IT jokes, while two Agents (David Koechner and Terry Crews) make the usual dweeb jokes about the IT guys. More lost screentime. After CONTROL HQ is destroyed by KAOS, the organization intent on spreading… uh, chaos, Max is made a field agent and sent on a mission that I didn’t pay enough attention to for it to be worth mentioning. The mission is the McGuffin, serving only to give Max something serious to aim for while he misses the mark with unfunny gags, including shooting himself with tiny darts, dancing with a fat lady, being dragged by a train… while we, the Susceptible Audience, are hopefully busting a gut. Suffice to say, Max and 99 eventually blow up a WMD facility (oh, how very Dubya of them! ), while fighting a villain who looks like Jaws from THE SPY WHO LOVED ME. Instead of the coy bedroom eyes of Barbara Feldon, Anne Hathaway plays Agent 99 as if she’s on a constant period. Dwayne (formerly The Rock) Johnson is given too little screentime for his smarmy assassin character. Alan Arkin plays The Chief almost as flustered as the original’s Edward Platt. Instead of the fruitiness of Bernie Kopell’s Siegfried, Terence Stamp plays the “Cherman” villain as if he’s on a constant period. Stamp is almost the same age as Bernie Kopell (who is relegated to a cameo), so the question is, why couldn’t the real Siegfried play Siegfried? Max’s iconic one-liners just don’t work – “Sorry about that, Chief!” “Missed it by that much!” “Would you believe…?” – because they are said only once and never given the chance to grow into callbacks. This movie would be enjoyable for youngsters who have never seen the original television series (which would look dated and unfunny to them anyway). The only way for it to be enjoyable for those of us who have seen the television series – is to watch the television series. I miss Don Adams’s slapshot delivery. I miss Thaddeus’s furrowed brow. I miss 99 saving Max’s life and not turning it into a fist-up for feminists. It is obvious the filmmakers don’t “get” GET SMART. They missed it… by THAT much. The DVD features a “Comedy Optimization Mode” with “hilarious alternative jokes.” That’s a good thing, since the actual jokes in the film are NOT “hilarious.” One alternative gag shows two Middle Eastern “terrorists” (they must be terrorists cos they’re Middle Eastern, right? ), wearing their white sheet-like garb, commenting to each other, “I’m not wearing any underwear.” “Neither am I.” When I rail at movies and songs stealing ideas of mine, I didn’t think they’d actually steal one of my gags from fourth grade. According to IMDb, Steve Carell and B.J. Novak did uncredited work on the script. I don’t blame them. I wouldn’t put my name on this stinker either. Writers: Tom J. Astle, Matt Ember, Mel Brooks, Buck Henry. Producers: Charles Roven, Andrew Lazar, Michael Ewing, Steve Carell. Starring: Steve Carell, Anne Hathaway, Dwayne Johnson, Alan Arkin, Terence Stamp, David Koechner, Bill Murray, Terry Crews, James Caan, Patrick Warburton. Ken Davitian.